The US Centers for Disease Control (CDC) numbers came out yesterday for flu vaccine efficacy and the numbers are far from impressive. The CDC says the vaccine, which was touted as a good match for this year’s viral strains, is now said to have prevented influenza in just 56% of adults and children overall. For adults over the age of 65, the results were a dismal 9% effectiveness. So how does the CDC arrive at these figures? How do we know it was effective even 56% of the time? Their report says to calculate how well the vaccine worked their “experts” examined 2,697 children and adults who showed up at a doctor’s office or clinics with flu-like illness. I stress flu-like, because many people think they have the flu when they have a fever and body aches (which are, BTW, usually caused by the fever itself, and not a particular virus). 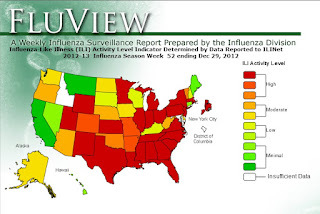 I have no idea how flu vaccine effectiveness can be accurately calculated. Is it not entirely possible that someone who gets vaccinated and does not get the flu was simply not exposed to it? Or conversely, that not nearly as many people as we think actually have the flu and but rather a different viral infection? It seems the CDC likes to make flu seem as big, bad and prevalent as possible, but to know if flu is the actual culprit, a culture is needed. The CDC pushes flu vaccination, which isn't even very effective against the viral strain it is designed to prevent; obviously no immunity would be conferred against a "flu-like virus", which isn't actually even influenza. 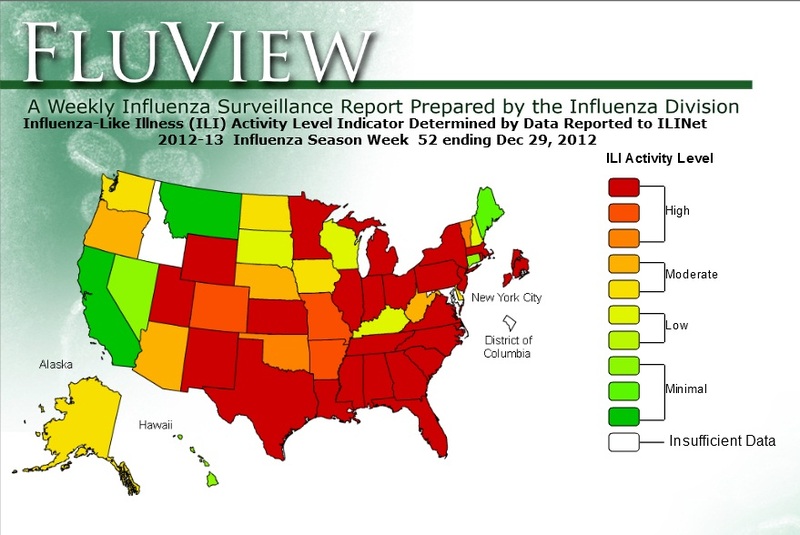 CDC's flu map. Note that it says "Influenza-like" Illness, not "Influenza"
Remember back in 2009 when swine flu was the latest “pandemic” that was said would wipe out humanity? It was compared to the Spanish flu outbreak of 1918— yes, 1918, two years before American women were granted the right to vote, when Babe Ruth was still playing baseball. Nearly a century ago...as if we live under the same conditions now. Consider this report by CBS investigative reporter Sharyl Atkisson about swine flu cases--Ms. Atkisson found in her investigation was of the “probable” or “presumed” cases of swine flu, most were not even flu at all. The late July 2009, the CDC abruptly advised states to stop testing for H1N1 (swine flu) and stopped counting individual cases. The rationale was there was no need to waste resources testing for swine flu when the government had already confirmed there was an epidemic. Or perhaps because there wasn’t an epidemic at all and this didn’t fit into the scare tactics we were treated to about the particular deadliness of swine flu. Next consider why our government feels the need to act like a drug pusher when it comes to the flu vaccine, at the same time acknowledging its lack of effectiveness. I’m exaggerating…perhaps, but not by much. 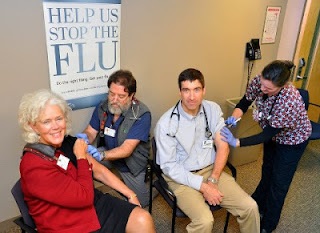 You can submit your “Flu Vaccination Promotion Events” to the CDC…and there’s even a “CDC Flu Vaccination Pledge” you can take. You check four blocks saying you will be or were vaccinated, and will encourage everyone around you to do the same. And this for a vaccine the CDC itself acknowledges isn’t even very effective. The CDC has an entire division devoted to the flu. Do you think job preservation is a factor in the scare tactics? The premise that there are no serious side effects to vaccination is a flawed one, and while vaccines are being pushed as “your duty” and “completely safe”, the fact is they are not. Consider the case of Kaylynne Matten. Last flu season she visited her pediatrician for an annual check-up and received a flu shot. The next day she developed a bad headache and a fever. Four days after her flu shot, the normally happy and healthy girl who had no history of health problems turned blue, stopped breathing and died in her mother’s arms. The medical profession will tell you this was all one big coincidence, as is typical when someone is vaccine-injured. Parents are pressured to vaccinate their children, and when something goes amiss—not all that uncommon, incidentally-- all culpability is denied. Health officials in Kaylynne’s state of Vermont stated they were more worried about the effects of news reports linking her death to the flu shot, resulting in parents opting out of the vaccine. A 7 year old child dies days after receiving a “safe vaccine”, and state officials’ primary concern is the effects her death will have on vaccine statistics. Seriously? When healthy children suddenly become sick after vaccination with the very side effects the vaccine inserts warn you about, but you don’t take the time to read, your doctor, the government and pharmaceutical companies deny any connection or responsibility. In fact, vaccine manufacturers are granted immunity from any vaccine injury you or your child might incur. Do you know of any other products that enjoy this protection? It is known that previous swine flu vaccines were “associated with an increased frequency of Guillain Barré Syndrome”—this is right in the flu vaccine inserts and was the subject of a “60 Minutes” investigation years ago. Flu vaccine inserts state, “If Guillain-Barré has occurred within 6 weeks of previous influenza vaccination, the decision…should be based on careful consideration of the potential benefits and risks.” In fact, GBS is listed as a side-effect of vaccination. 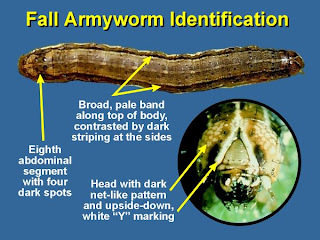 “The disease is thought to be autoimmune and triggered by a stimulus of external origin.”1,2 Like a vaccine, perhaps? Google Guillain Barré and vaccines and you’ll find out that it’s not really all that uncommon…and tell me if it still seems rare if it happens to you or your loved ones. Also in flu vaccine inserts: “Safety has not been established in pregnant women”…they also say it is not known if fetal harm might result. Yet pregnant women in the US are encouraged to get flu vaccines because, as I’ve heard on the news, they have a “greater risk of severe complications, even death from flu”. Give me a break. We should essentially test out the safety of this vaccine on fetuses, whose blood-brain barrier is not fully developed? Add to that, thimerosal (50% ethyl mercury) is still used in multi-dose vials of flu vaccines. But ethyl mercury is the “safe form of mercury”, right? Studies show that although ethyl mercury is removed from the bloodstream twice as fast as methyl mercury (considered the “bad” mercury), it stays in the brain 1.7 – 3 times as long as methyl mercury. You can have this guy's cells injected in you...in the name of flu prevention! Still feel like injecting yourself or your children with this Franken-science? I don’t know about you, but we’ll take our chances with the flu. 1 1. McGrogan A, Madle GC, Seaman HE, de Vries CS. The epidemiology of Guillain-Barré syndrome worldwide: a systemic literature review. Neuroepidemiology. 2009; 32(2): 150-163. I'm with you on flu vaccines. I'll take my chances and opt out.